I seem to have strained my wrists, so I’m taking a crochet break (boo) and continuing with some sewing (yay!). Following on from my last sewing post, I’ve attempted some leggings. For leggings I often have the problem that they aren’t long enough. I also really don’t like it when leggings have a lot of gathering going on at the waist because it can show through when wearing with a tighter fitting top (and it’s unnecessary bulk on the tummy, no one wants that!). I’m not new to sewing but I do need to develop my skills so I’m trying to stretch myself with just one or two new skills each time I make something. Usually I make skirts, which really only need to fit at the waist, so they aren’t too hard to get right. These leggings required fitting to my complete lower half – so that’s the new skill this time around. I used the method on So Sew Easy to draft my own pattern to my measurements. This worked fine and took me about an hour (including taping together a zillion sheets of paper). I used a 0.95 factor for negative ease but could have gone to 0.9 in retrospect. For the fabric I ordered the same as I used for my black maxi skirt, which was better quality than I expected for the price and definitely good for leggings. However I think the grey version is not quite as thick though it does the job fine. 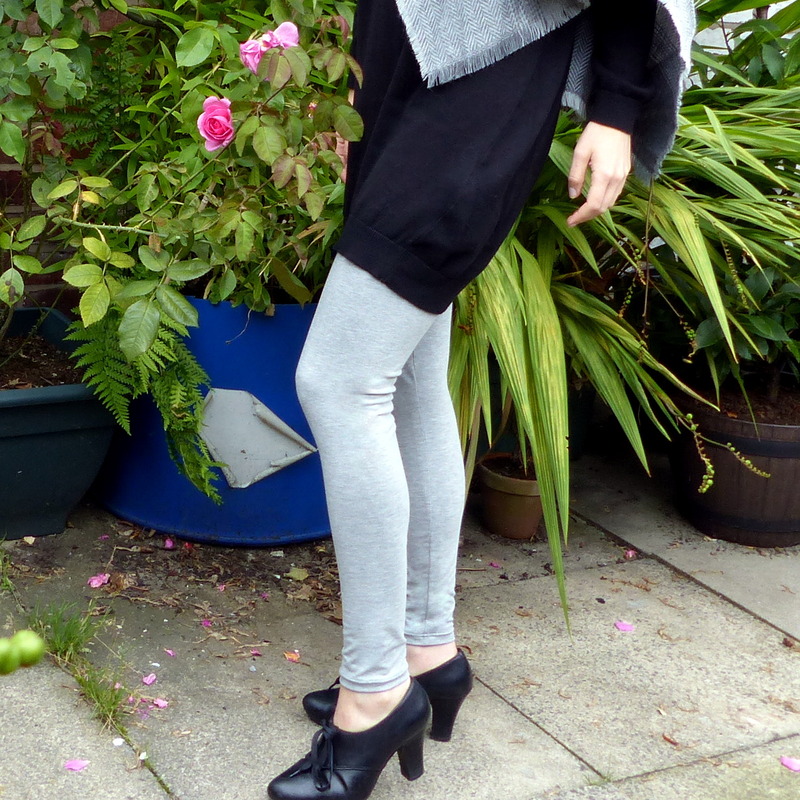 Sewing my own leggings – no gathering at the waist! The leggings sewed up nice and fast but definitely came out too long by about 2-3”. I think maybe because the pattern seems to assume that the fabric won’t stretch in the vertical direction but mine does. Not a problem because I can shorten them (this never happens to me!!). They also need the seam at the knee taking in, I suspect because the extra length means the knee point is a bit too low, making them a bit baggy at the knee. I ended up struggling to re-hem the ankles. I had originally hemmed them before sewing the leg seam because I thought it would be less fiddly. Re-hemming them meant stretching the leg over the free arm of my machine and they really did only just fit, in fact I think the fabric got overstretched as a result so the ankles are still a bit loose. When I make these again I will take out an inch between the knee and thigh, and also an inch between the knee and ankle on my pattern and hopefully they will be a perfect fit first time! Have you had success with self-drafted patterns? Let me know your tips! These look awesome! I’m going to give the pattern a try. When sewing tight circles, I sew from the inside, rather than looping over the free arm. Hard to describe, but using a bracelet as an analogy, it would be standing up and I sew on the bottom on the inside. Thanks and nice tip! However I had to sew from the front as I was using my double needle to get two rows of straight stitching but with stretch. It doesn’t look the same from the back. In hindsight I could just have used the zigzag stitch and gone for the neater fit, I will remember the tip if it happens again! Hopefully next time it won’t be a problem though! I hope your wrists feel better soon so you can get back to the crochet.